I did not like the outside areas of Merrill Gardens at Green Valley Ranch and I didnt feel the inside of the community since it seemed more sterile. The staff was nice and the food was fair. Thank you for taking the time to provide us with your feedback. We are disappointed that our community did not match your expectations. We appreciate hearing that our team made a positive impression. Please let us know if we can be of any assistance as you research senior living options. Merrill Gardens was in a very nice neighborhood, and the facility was nice. The people were very helpful. The food was very good, and you can eat at any time. Thank you for this review of Merrill Gardens! We are glad to hear you enjoyed the people and the food. We are proud of our Anytime Dining program, so this is wonderful to see. My mom was at Merrill Gardens at Green Valley Ranch. The place was expensive. They had activities like bingo and music, but the staff would not get the residents to participate in activities. They left it up to the residents to come. We appreciate you taking the time to write us this review. We are sorry to hear that you didn't see our team members asking residents to participate in activities. We aim to promote involvement in activities while also honoring a resident's choice not to participate. I really like Merrill Gardens at Green Valley Ranch actually. The environment was nice. It was like a hotel. It was really nice, and it was my favorite. Actually, it was one that I really want to place my mother-in-law in. I really love everything about it. I love the rooms, I love the community of it, and I love the people there. They knew every resident, and they knew about every resident; they knew their habits, and they knew their good days and their bad days. The only thing is that they don't have a memory wing. We are so glad to receive this positive review. Thank you for telling us about your experience with Merrill Gardens. We would be happy to welcome your mother-in-law to our community for a visit! I think Merrill Gardens at Green Valley Ranch was the most beautiful one -- the best one actually -- in my opinion; however, my sister isn’t coming here until the end of October. They were very nice. I like it a lot. If it was my choice, I would probably be there, but it is not for me; it’s for my sister. The lady at Merrill Gardens was excellent. I thought it was a very lovely place. However, there was no activity going on at that time. We are so happy to hear about your positive impression of Merrill Gardens. We hope that your sister is as pleased with the community as you are. Please let us know if we can provide any additional information. Merrill Gardens was a fantastic place, but it was only for independent and assisted living. I did have lunch there, and they had a very nice menu. The 1-bedroom rooms and the facility itself were very nice very well kept. Everything looked almost like it was new. The whole place was very well-kept. We are glad to hear that you had an enjoyable experience while visiting Merrill Gardens, and that the lunch was good as well. Please let us know if there are any additional questions we can answer for you. I thought Merrill Gardens at Green Valley Ranch was nice, but it was also one of the most expensive. They had the best grounds, and it was more an upscale neighborhood. They were not structured to the extent where if you wanted to have your breakfast at 1 in the afternoon, you could do it. I thought they were decent and nice rooms. They gave me lunch; the food was good. I can it recommend to anyone depending on their economic circumstances. Thank you for telling us about your visit to Merrill Gardens. We are glad you had an opportunity to experience our food and learn about our Anytime Dining program. I liked Merrill Gardens at Green Valley Ranch. It was very nice. They have a gym with gym equipment and a library. They have classes, and someone comes in and does basically some different things. The rooms were very small, like all of them. The food was delicious. Thank you for providing us with this positive review! We are glad to hear that you enjoyed Merrill Gardens at Green Valley Ranch. Merrill Gardens is a nice facility with very nice rooms, lobby, dining room, and porch area. It's relatively new and very nicely decorated. They had a movie room, a library, and a bar set up. Once a week, they had an open bar. The staff seemed very nice. Thank you for providing us with this feedback. We appreciate you taking the time to let us know about your experience. Please let us know if you have any questions. I visited Merrill Gardens. It's a beautiful place that looks like it would've provided for all my friend's needs; however, it was pricey. The staff was very helpful and informative. The room was nice. You could have a studio apartment or a one-bedroom apartment. They take the residents to doctors' appointments and to various places around the community, like one of the major parks in the area and concerts. They go to nearby casinos and churches. Thanks so much for writing this positive review for Merrill Gardens. We will be sure to pass along the feedback to everyone on our community team! Merrill Gardens at Green Valley Ranch was my first choice, but they didn't have a memory unit. Elderly people don’t always have an eating schedule, and their kitchen was open 24 hours a day. They seemed like they had more activities, and their rooms were a little bigger than in other places. They were too open about when they lock their doors, and I was afraid that my uncle might wander. The room they were giving him was right by an unlocked door, and they didn't lock their doors until 8:00 or 9:00 at night. Before then, those doors were never really locked and anybody on the inside could go out and walk right out into a parking lot. For him, I didn't think it was safe enough, so I did not push it when he picked the other place. It was all really nice and beautiful. That would have been my first pick, but when you start fine-tuning it, his room was emptying right into a parking lot, which I didn't like, and I just didn’t feel like it was quite safe enough for him. The rooms were cheaper, and I liked the way their food was delivered. Thank you so much for taking the time to provide us with this feedback. We are happy to hear that you enjoyed Merrill Gardens and that you found an option that works for your uncle. Please don't hesitate to reach back out with any questions. My mother-in-law is very happy at Merrill Gardens. It is a fabulous place, and she loves it. She is thriving there, so it's wonderful. Their food is gourmet food, which is above and beyond other facilities I looked at. Their food is outstanding. They can eat three times a day, and the restaurant is never closed from 7:00 a.m. until 7:00 p.m. She is in a one-bedroom, which is 719 square feet. They don't just give them a microwave, but a stove as well. They have a movie every night in their movie theater, which is very plush. They have a pool and a putting green. They do aquatic exercise in the summertime. They went to a river dam on a tour. They have live entertainment three times a week and happy hour. It was just spotlessly clean. The staff is cheerful and super nice. She's as happy as a clam. They have a doctor that comes every Tuesday. This place is amazing. It's like living in a resort. Valerie, their director, is awesome. She is amazing, and she'll do anything for the residents. We are so pleased to hear that your mother-in-law is happy at Merrill Gardens. We appreciate all of the wonderful feedback and look forward to continuing to offer a great experience! Please don't hesitate to contact us if you should have any questions. I lived at Merrill Gardens at Green Valley Ranch for a couple of months. I really got along well with the staff. The facility was nice, but I wasn’t able to make friends. For most of the time I was there, there were no activities because we were under quarantine, and they couldn’t allow the residents to mingle. They would just serve your meals, and you couldn’t go into the lunch room. Thank you so much for your review. We appreciate the feedback and we are glad to hear that you got along with our team members. In April 2014 there was a flu outbreak that impacted the greater Las Vegas area. A number of senior living communities were impacted, including ours. We worked closely with the Southern Nevada Health District and the state epidemiology office. The outbreak was contained and we resumed normal operations at the community as quickly as we could. If you have additional feedback that you would like to share, please don't hesitate to contact us directly. Merrill Gardens was a very nice facility. It was fairly new, and the people were friendly. It had every amenity that you could possibly ask for, but it was very expensive. They had a formal dining room, a billiard room, a beauty salon, an exercise room, an outdoor garden, a swimming pool, walking path -- you name it they got it. It was an excellent facility if you could afford to live there. It was very plush, elegant, and top of the line. There was no downside because you needed a lot of money to live there. A family member lives here. It started out a nice place, but it has gone downhill. Windows have not been washed in 2 years, carpeting has not been cleaned as promised. The lock on the door does not work and after repeated requests over the past several months resorted to a broom handle. Staff is continually changing, which results in no consistency of treatment. Activities director constantly leaves and 90% of what was promised is no longer provided, yet their advertising continues to emphasis items. We are looking for another place. We went to see Merrill Gardens and we liked that. It had a nice atmosphere and we had a good tour. It was a combination of an independent and assisted living, which was under one roof. It had a nice dinner menu and the food was good. They had a big nice dining room. The staff was very good. They were very helpful. However, they hadn't any large two bedroom apartments and we needed the space. I would recommend them to others. It used to be a good facility - no longer. There is high staff turnover and several of the residents have recently left. I certainly do no recommend this Sr. residence for any of my family members. Mom and Dad are at Merrill Gardens and it's just absolutely wonderful. They have a great facility there. I'm very happy with it and so are they. We went through about 20 of them and this is the one we liked the best. They are the Cadillac of all other ones in Las Vegas, unbelievable. Looks like a 5-star hotel. The food is magnificent compared to what they had at the other place. They had lobster and shrimp on New Year's Day. They feed them very, very well. They have a lot of activities. They have card clubs, they have a library, they have movies every single night. They have wine and tasting on Tuesday night so they all go to the bar and have drinks. They're close to shopping, close to restaurants, close to the freeway, next to Green Valley Ranch casino so they can go to the casino each night. I want to live there, I'm just not old enough. My mom chose to stay at Merrill Gardens at Green Valley Ranch. It was in a very nice area, upscale community and a nice neighborhood. She had two bedrooms, two bathrooms, a full kitchen, washer and dryer. It met all her requirements and it was lesser than the place she lived before. I would highly recommend Merrill Gardens. The surrounding was gorgeous. The staff was fantastic. The rooms were beautiful and the food was excellent. My mom is a resident of Merrill Gardens. This place is really top notch. It has a library, activity and wellness center, salon, and even an ice cream parlor. The staff is great, my other raves about them. They have a lot of activities for the residents which is really important. The facility is spotless and feels like you are on vacation instead of an institution. It's a busy place, with senior citizens scooting around in wheelchairs, and a lot of nurses and volunteers. The staff is very accommodating, even allowing loved ones to stay the night. The rooms are set up like hotels. Your even allowed to bring in your pets if they make you feel better. Most rooms have a balcony and there is plenty of art around to wander around and look at. There is a nurse and doctor on standby 24 hrs a day. It is a little pricey but worth every penny. We visited Merrill Gardens at Green Valley Ranch for my mother-in-law. I liked the dining room and food. They deliver meals to your room. The staff was nice. We saw one or two rooms that were nicely painted in neutral colors. We liked the location, and the grounds were nice, well-kept-up, private, and off the beaten path. They had a game room, arts and crafts room, and massage room. They had outings, and if you have prescriptions, they can get it for you. Hi Tracy, thank you for taking the time to leave us this review. We are happy to hear that the team was nice and that you enjoyed the location. We're in love with Merrill Gardens at Green Valley Ranch. It was like going to a resort in Florida. It’s absolutely beautiful and the nicest in all of Las Vegas or Henderson. It had everything we want. The rooms were beautiful. The food was available 24 hours a day, and they didn't have set times to eat. The staff was wonderful and provided us with delicious food. We are so happy to receive this feedback. Thank you for taking time to write us this review. We are very proud of our Anytime Dining program so we appreciate hearing that you enjoyed it as well. We visited Merrill Gardens, which was really close to Green Valley Ranch Casino. In the community, there’s shopping right there and a lot of activities. It’s right by the Henderson Convention Area, so you’d be able to do quite a bit, and they do take you places. It's a fairly new building, priced accordingly. If you are going to go into a new building, you are going to pay more. The activities are all excellent. Thank you for writing us this positive review. Merrill Gardens at Green Valley Ranch is located in a great area with access to many activities. Please let us know if there are any questions we can answer for you. My daughter really liked it, and I kind of like it too. Merrill Gardens has kitchenettes; every room has the stove, a refrigerator, and a microwave. I really didn’t have an opportunity to have much of an interaction with the residents because it was close to noon, and they hadn’t come to eat yet. There were very few people wandering the hallways, and doing anything in particular. There were a couple of people reading the newspaper in easy chairs, and stuff like that. The lady that took us around did an excellent job of explaining things to us. Just from the staff’s viewpoint, they were very kind, and very well explained to me exactly what they do. It was absolutely clean. Thank you for taking the time to provide us with this positive feedback for Merrill Gardens at Green Valley Ranch. Please reach back out to us with any questions or additional comments. Merrill Gardens was way better than most of the facilities I went to. It offers six stages of care without her having to leave her apartment. The place is five years old, very clean and modern. They served meals from 7 in the morning to 7PM. The staff has been very helpful, and their maintenance people have helped mom hang stuff in her apartment. We want to thank you for taking your time to write us this 5-star review. We are so happy that Merrill Gardens has provided you and your mom with a positive experience. Please contact us directly if there is anything additional we can do! I had visited Merrill Gardens before my mother-in-law moved in. I wouldn't have chosen it because I thought they didn't have enough staff and the staff was undertrained. There were no recreational programs except for cards. My mother-in-law hated the food. The people who lived there tried talking many times with the kitchen staff and with the director, and it's not getting better. My brother-in-law had been very involved in trying to resolve the food issue because people would go to the dining hall, wait for a glass of water for half an hour, and another half hour to place the order. The people looked sad to me. However, the room was fine. Thank you for leaving this response and bringing these issues to our attention. We are disappointed to learn that you were not satisfied with several aspects of our community. Please call us directly if you would like to discuss any of these items. I'm currently staying at Merrill Gardens. This is a lovely place. What stands out for this facility is the surroundings and the people. The apartments are large. There is a washer-dryer in every apartment. The staff for the most part are also very nice. Located in between Discovery & Paseo Verde Parks. 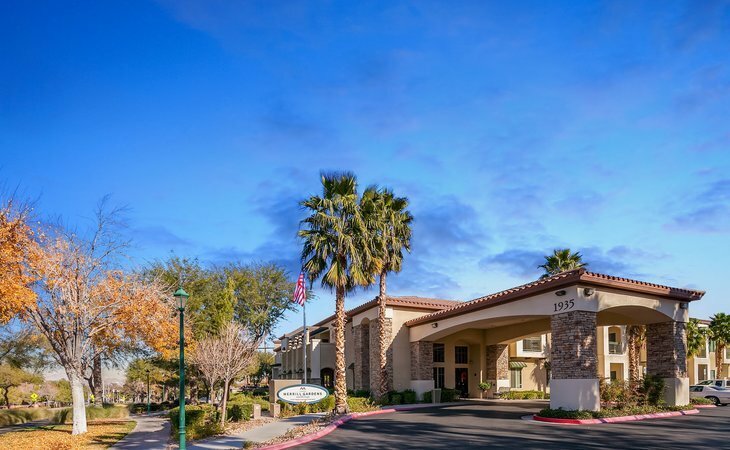 1 mile away from District Shopping Center & Green Valley Ranch Hotel & Casino. 20 minutes from Las Vegas. Library. Activity and wellness center. Complimentary internet access. Ice cream parlor. Theater room with webinar capabilities. Electronic security key system. Osher Lifelong Learning Institute continuing education classes (on-site). Outdoor pool. Paved walking paths & garden areas. Landscaped grounds. Parking for residents. What should caregivers and potential residents know about Merrill Gardens at Green Valley Ranch?